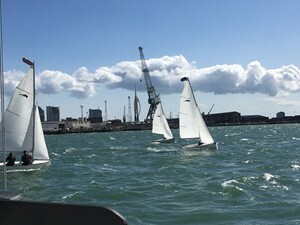 Thirteen plucky RN sailors descended upon a breezy Portsmouth for the Woodcock Trophy organised by RNSA(P) Dinghy Rep Lt Matt Irwin. The strong forecast didn’t deter the enthusiastic Bosun sailors who came from units across the Eastern Region including Portsmouth, HMS Collingwood and RNAS Yeovilton. Designed to encourage participation and increase awareness of RNSA, the event rules required each boat to include one novice sailor. Those new to the sport were welcomed with testing conditions but this ultimately led to a far more exhilarating competition. Six boats launched in a Force 4-5 Westerly breeze. A series of unfortunate gusts forced one boat from 825NAS to retire early whilst a second boat from NCHQ suffered a mainsheet failure seconds before the first start, again forcing retirement. The remaining 4 boats set off around the short, 2 lap triangular course in close competition. NCHQ1 (consisting of Rear Commodore Dinghies Cdr Gavin Marshall and Lt Cdr Rubin Nash) held a respectable lead throughout although was never far ahead of the RM School of Music (RMSoM) boat (Musns. Kerry Marsden and Hannah Smither) or NCHQ2 (Lt Cdr Andrew Thomas and Lt Rob Guest). The latter two regularly traded places between 2nd and 3rd with 825NAS (LAET Kirsty Rothwell and AET Joe Davidson-Phillips) following closely behind. Conditions remained in limits for a second race and with an even closer start, the fleet was off again. NCHQ1 again established a commanding lead with the other 3 boats fighting hard for 2nd place. NCHQ2 was forced to retire after catching a shroud on a moored fishing vessel, a feat for which the crew received a suitable ribbing ashore. RMSoM finished in 2nd with 825NAS in 3rd. With 2 successful races completed, half the starting fleet ashore and no sign of the weather abating, the decision was made to return to the sailing centre. Once all the boats were packed away, the sailors gathered to re-live their exploits over a cup of tea and nibbles before a modest prizegiving funded by RNSA(P). NCHQ1 took the glory ahead of RMSoM in 2nd and NCHQ2/825NAS in joint 3rd . The RNSC as usual enabled an excellent competition and thanks go to Chief Instructor Claire, safety boat coxswain Dave (ably assisted by LAET Simon McGee of 825NAS) as well as the support team who prepared all of the boats. Portsmouth Branch looks forward to further Dinghy racing in the form of the Baring Cup on Wed 4 Jul (any boat handicap racing) and Thursday night racing during June and July (dates/format TBC). Further details will be published on the Royal Navy Dinghy Sailors Facebook page and RNSA website in due course. The weather is getting better (allegedly) – hope to see you on the water soon!